Ticks are tiny parasites that can be found anywhere, from the deep woods and urban parks to backyards. 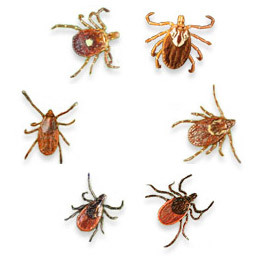 Each year thousands of dogs and cats become infected with serious diseases transmitted by a number of different ticks. The most common diseases are ehrlichiosis, Lyme disease, vector-borne disease and anaplasmosis. But some ticks are known to carry more than one of these diseases, which can lead to multiple infections, complicated treatments and greater health risks. The risk of exposure to vector-borne disease has increased in recent years as more and more people and pets move into areas that were previously wild and still rapidly inhabited by ticks. Symptoms of diseases caused by ticks are often vague and difficult to recognize, thus many pet owners don’t know their dog or cat is suffering from a debilitating tick disease until it’s too late. Amber is not a stone, but a fossilized pine tree resin. Amber as a purely organic product originated due to millions of years of heat and pressure. Some scientists claim that Baltic amber is 50 million years old. Throughout this long history amber has been valued and admired not only for its beauty, but for its healing and therapeutic powers as well. Ancient Egyptians, Greeks and Romans believed in the magic powers of amber, it was believed that its electrostatic energy had the power to draw all misfortunes away from people. 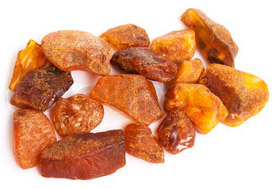 · Baltic amber contains succinic acid, which is directly absorbed into the skin and bloodstream. Succinic acid is highly antimicrobial, boosts immunity and anti-inflammatory. · It has analgesic properties, which functions as a pain relief. This is why amber necklaces are used for babies during their teething period. · Raw Baltic amber has a calming effects for the wearer. Recently amber got well-known for its inclusions - ancient insects and plants trapped inside that gave scientists a clue on the life-cycle millions of years ago. Each year, millions of people purchase flea and tick protection products believing that these products have been thoroughly tested and are safe for both pets and their owners. There are numerous products and medications available to keep ticks off your dog. Some veterinarians suggest applying topical medication on a small area on the back of the pet; some will also vaccinate to prevent Lyme disease in dogs. In any case, chemical medications include ingredients such as permethrin, pyrethrin or fipronil. They are all pesticides that kill insects by paralyzing their nervous system which is also how nerve gas works. But the problem is that these chemicals have the same effect on insect’s nervous system, animal’s nervous system or a human’s nervous system. 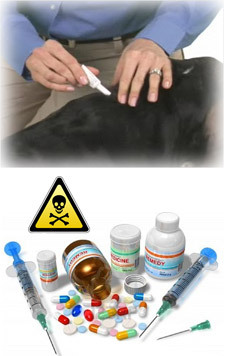 So by using such medications humans can be poisoning not only their pet, but themselves as well. Children are especially at risk of acute poisoning and long-term health effects. Our experience shows that chemical medications do work, but they have to be applied on a regular basis and the pet has to be kept isolated for at least 3-4 days after the topical medication, sprays or powders had been applied. We consider such methods as antibiotics for humans – use them only and only when there’s no other way. Ambertick as a tick and flea repellent works in two ways. 1. Amber is a fossilized tree resin which contains aromatic chemicals called terpenes which effervesce when amber is heated or rubbed and produce a resinous aroma. When the pet wears the stones on his neck, the friction from their fur will absorb the resinous smell coming from the amber. Precisely these resinous aromatic terpenes being released and absorbed in the animal’s fur is the reason that repels the ticks and fleas. Although these parasites do not have a nose but they do have a Haller organ located on its front legs. It helps the tick to perceive the smell of a potential victim. By the way, tree sap works the same in nature - when a tree bleeds, it bleeds a sticky sap to protect itself from insects and fungus. 2. Another effect of amber is caused by its electrostatic properties. Static electrical charge is generated due to friction that is created when Amber is rubbed against the fur. 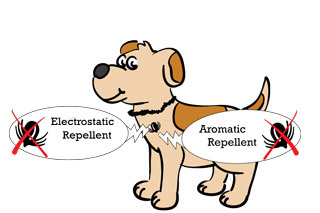 Naturally a cat or a dog doesn’t feel it but every tick that comes in contact with the electrically charged fur gets an electric shock and just falls off. This static electricity effect was discovered by the ancient Greeks, which originally gave the name of amber to the mysterious stone found on the coast of Baltic Sea – Amber in Greek means electron. Each Amber piece is separated by knots in order to spin easier and charge up at maximum capacity. Long lasting. It only needs to be washed thoroughly every 3 months in order to remove the grease. 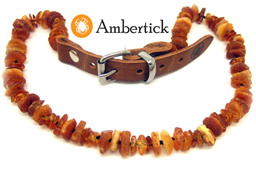 Ambertick is produced in the heart of Baltic Amber industry - Lithuania, one of the Baltic States in Europe. NOTE: Ambertick leather fastener adjusts by 5 cm or 2 inches. 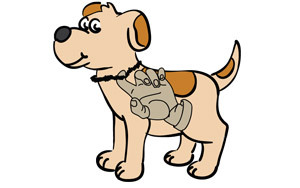 If your pet has a long fur, there’s no need to make the collar visible. It can be hidden under the hair – the friction between the amber and the fur will do the trick.